The viceroy butterfly (Basilarchia archippus) looks very similar in appearance to the monarch butterfly (Danaus plexippus). However, you can tell the difference between the two butterflies because the viceroy has a curved black line on both of its hindwings, but the monarch does not. Notice the difference in the photos of the two butterflies on this page. 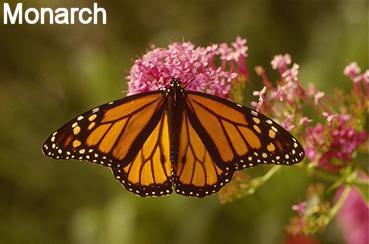 The top photo is of a viceroy and the photo below is of a monarch butterfly. Both the monarch and viceroy butterflies belong to the family Nymphalidae. Because the viceroy is similar in appearance to the monarch butterfly it enjoys some protection from predators (e.g., birds). Most butterfly predators won't eat the monarch butterfly. This is because the monarch caterpillar eats milkweed plants, which causes the adult butterfly to be unpalatable. The viceroy butterfly is similar enough in appearance to fool most butterfly predators into thinking that it also tastes bad, and so it is usually left alone, despite that its caterpillar doesn't feed on milkweed. As you can see in the top photo, the caterpillar of the viceroy butterfly is well camouflaged. It is brown and white and looks similar to bird droppings. Viceroy caterpillars feed mainly on willow and poplar. The chrysalis stage, also shown in the top photo, also looks somewhat similar to bird droppings, which serves to protect it from predators while in this vulnerable life stage. The adult butterfly has a wingspan of about 3 inches (8 cm). 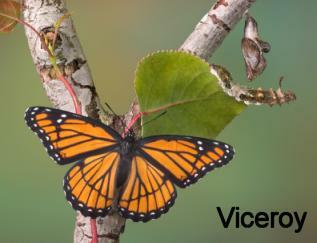 The viceroy is found throughout most of the mid to eastern United States.